A good general rule is that smaller dogs with thin coats may need sweaters or coats when going into the elements. And even larger dogs with thin coats will want a bit more protection, often inside as well, if you don’t use a lot of heat. Chihuahuas, poodles, and other dogs who are small and whose coats are cropped to prevent matting, will do well in a sweater for the inside and a coat for the outside. Especially if you find that your dog is reluctant to go outside to relieve himself, he may be telling you that the cold temperatures are too uncomfortable for him. You can take your cue from your dog sometimes. If you see he is sitting in a corner shivering, a nice warm sweater would be just the thing. Large dogs with thick coats are breeds that adapt well to cold and won’t need clothing to stay warm. But some larger dogs like whippets and greyhounds, whose coats tend to be thin, may need some protection from the cold. Older dogs, whose immune systems aren’t what they once were, will want to have more protection in the cold weather. And there are some dogs that are just more sensitive to seasonal changes that will need some outerwear. 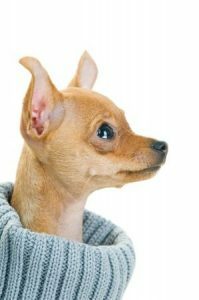 Sweaters and coats for dogs have become very fashionable, so there is every chance that you will find a garment that will suit your dog. Your pet’s well being and comfort should be your primary concern. You have not become one of “them”, by putting a coat on your dog. It doesn’t mean that the next step is a dress. This is an issue of practicality and your dog’s comfort. So don’t hesitate to dress your dog in warm clothing when the temperature is frigid. He will be very grateful.